Tickets to the Shift acrobatics show at Shoreditch Town Hall available now! This Spring, the insanely talented Barely Methodical Troupe, creators of Bromance and Kin, are back on the London stage to bring you Shift. This dazzling production is a brand new piece - one packed with jaw-dropping stunts, spirit and endless entertainment, which promises to make you question everything you thought you knew about the laws of gravity. Barely Methodical Troupe are celebrated as one of Great Britain's most in-vogue circus companies and they are known for pushing the envelope when it comes to captivating audiences with their one-of-a-kind performance style. Their shows are a fantastic amalgamation of jaw-dropping acrobatic feats and heartfelt theatre. Who is in the Shift ensemble? Featuring all the core members of the troupe, Shift's audiences can expect to see the strong guy Louis Gift, global cyr wheeling star Charlie Wheeller, the gravity-defying Beren D'Amico, and the daring world-famous Swedish acrobat, Esmeralda Nikolajeff. Shift tickets on sale now! 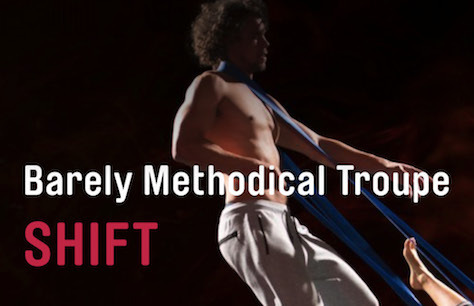 You don't want to miss Barely Methodical Troupe's Shift, an incredible new show that defies the laws of physics! With just a limited run at the Shoreditch Town Hall, Shift tickets will not last. Book your Shift Shoreditch Town Hall tickets now and enjoy the show!